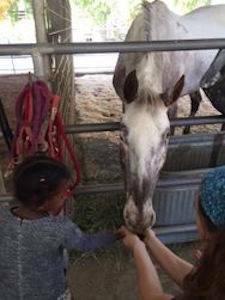 When one of the little girls noticed that Hero had a missing eye, she immediately said in complete sincerity, â€œIâ€™ll give her one of my eyes!â€� She then spent the day kissing, hugging, and holding all the animals. I pray that her spirit always shines so bright, that her heart remains open, and that her generosity is contagious among all her peers. I would love to know her in 20 years, I bet sheâ€™ll do something amazing for this world! When my daughter, Cheyanne, was two years old, she told me that when she grew up she wanted to be just like Michael Jackson. I wasnâ€™t exactly sure what that meant at the time but I told her that she could be anything she wanted to be. She then asked me to take her to learn to dance. So, we drove down the street to the local ballet studio and tried to sign her up, but we were told that the kids had to be three years old to start. I explained that to Cheyanne and promised her that we would sign her up as soon as she turned three. She immediately asked me to take her back to the dance studio. I signed her up to dance on her 3rd birthday and she has not stopped dancing since. At first, I thought it was a hobby that she would eventually outgrow, but now that she is eleven, I have come to accept that dancing is her life and will be her career. She is extremely professional and takes it seriously. Cheyanne is on two dance teams (Hip Hop and Contemporary), takes several classes every day, performs art competitions most weekends, and when she is not at LYTE Dance Studio, she is at home choreographing her own dances by herself or with her friends. She knows exactly who she is and what she has come here to do, my job is just to support her. There was a family that came to visit The Gentle Barn a few years ago who made a huge impression on me. They seemed very irritated as they walked up to me and once they had my attention, immediately told me how their two-year-old son wouldnâ€™t eat meat. Their whole family ate meat and they couldnâ€™t understand what was wrong with their son. They said that when he was watching TV and not paying attention, they would even sneak meat into his mouth with other food, and he immediately spat it out and said, â€œno meat, mommy!â€� I calmed their fears by explaining that he would be very healthy and helped them figure out how to make sure their very wise, enlightened son could get protein, iron, and calcium, and how to keep him strong and growing. I helped them understand the health benefits of a plant-based diet and by the time they left they had a plan and some newfound respect for their baby boy. This very young boy knew exactly what he believed in, and knew the truth, even though no one had really taught it to him. In our society, we believe that the adults are here to teach the children. We send them to school and enroll them in activities that we think are good for them. We introduce them to our beliefs, our traditions, and to what we hold as important. But I believe that the children are here to teach us. I believe that when we keep them safe, and nurture their interests and beliefs, they are the ones who will guide us to new principles, show us the way, and ultimately save our planet. I think that all of us have come here loving animals and connected to nature. As we grow in our high- tech, concrete, western culture, we eventually disconnect from nature, and deny our instincts. This has resulted in so many of us who work in jobs we hate, live lives we never intended, and donâ€™t recognize an instinct if our lives depended on it. It is imperative that we not only find ways to nurture our own passions and values, but that we support our children in their interests, in their values, and in their instincts. We need future generations who can live fulfilled lives, be connected and open, and who will live on purpose, fulfill their destinies and care about the planet and all its inhabitants. I believe we can only do that if we teach our children values and ethics, expose them to as many wonderful things as possible, and let them guide us as to who they are, what they believe in, and what they want to do. If all of us got to sing the song we came here to sing, dance the dance we came here to dance, and share the gifts that we have come here to share with the world, what a glorious world this will be! 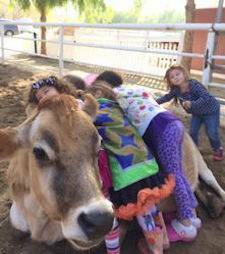 Each day we host groups of children at The Gentle Barn. In addition to connecting them to nature and animals, and planting the seeds of kindness and compassion, our job is to validate their spirits, be their witness, and catch them being remarkable. She then spent the day kissing, hugging, and holding all the animals. I pray that her spirit always shines so bright, that her heart remains open, and that her generosity is contagious among all her peers. I would love to know her in 20 years, I bet sheâ€™ll do something amazing for this world!